St Patrick’s Academy, Dungannon booked their place in MacRory Cup final thanks to a seven point win over St Paul’s Bessbrook on Friday night. The Killymeal Road school led from the first minute to the last to seal their spot in the St Patrick’s Day showcase as they disposed of McCormick Cup holders. Just like their victory over St Patrick’s Maghera, the Academy laid the foundation for their success in a strong opening 30 minutes, as they built an unassailable eleven point advantage. Dungannon dominated at midfield throughout the game, Colin Campbell and Brian Kennedy giving their side a big physical advantage, while Stephen Corr marshalled the defence superbly. Up front Fintan McClure and Ryan Coleman gave the south Armagh men a torrid time, with Coleman in particular turning in a superb performance for the Academy. Dungannon took the lead after just 33 seconds as they broke up a Bessbrook attempt to clear from defence and ran through on goal. Cormac O’Hagan, influential throughout the contest, fed Daniel Kerr, and the nimble Galbally player found the net with a scuffed effort that the Bessbrook defenders just couldn’t keep out of the net. 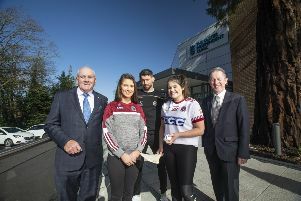 While Dungannon, playing with the advantage of a strong wind, kicked four consecutive wides Bessbrook took advantage of the wayward shooting as Shea Hoey pounced for a goal on a rare St Paul’s foray into the Dungannon half. That was to be a minor blip for the Academy as they goaled just two minutes later. Brian Kennedy picked out Fintan McClure at the edge of the square with a monstrous pass, and the Clonoe attacker was hauled to the ground by the Bessbrook defence. Cormac O’Hagan showed great composure to send Michael Murphy in the St Paul’s goal the wrong way and re-establish the three point Dungannon lead. Peter Herron and Ciaran Gourley’s side extended their advantage with three points over the course of the next five minutes. With St Paul’s struggling with their kick outs, Kennedy, Campbell, O’Hagan and Conn Kilpatrick provided Dungannon with plenty of primary possession. Fintan McClure added a free not long after the penalty and from the resulting kick-out Ryan Coleman played in Liam Rafferty who slotted his effort over the bar. His Galbally team mate Daniel Kerr added a point to the goal he got in the opening minute to help open a six point advantage. St Paul’s were in danger of being cast adrift after just 15 minutes, but to their credit they responded well with two fine scores coming from the boot of a lively Jody McGovern. Dungannon responded yet again, with Ryan Coleman kicking a terrific point from play to ease Academy worries. Mark Donnelly, was operating in a two man full-forward line with McClure and he got his name among the scorers with a point in the 20th minute. Just a minute later, midfielder Colin Campbell got the score his hard work deserved, as Dungannon now led by seven. Shortly after the lead was ten points as Daniel Kerr and Ryan Coleman combined to allow the Moy player, Coleman to finish to the net. This goal was sandwiched by two disallowed Dungannon efforts, Fintan McClure twice adjudged to have been in the square before the ball was kicked. While the second call was probably fair the first effort looked harsh. St Paul’s kept plugging away and got another point through centre-half back Ryan Gaskin, but two Cormac O’Hagan points pushed the Academy lead to eleven at the interval. The Armagh side needed to get a fast start in the second half but a couple of early wides didn’t help their chances. Bessbrook did open the scoring with a point from play four minutes in but it might well have been a goal. Dungannon responded almost immediately, Ryan Coleman linked up with substitute Patrick Molloy before firing a fine point from play. The Academy were defending tirelessly, getting men back and giving Bessbrook no time to settle on the ball. St Paul’s did rattle off three points in a row between the 39th and 42nd minutes but once again Coleman responded with a fine individual score for Dungannon. While Bessbrook did narrow the gap in the closing 15 minutes, with three more points they never looked like threatening the Academy. Half back Liam Rafferty rounded off the scoring for Dungannon with three minutes of the game remaining to seal Dungannon’s place in a first MacRory Cup decider since 2011. In the other semi final played yesterday, Sunday, St Pats , Cavan, defeated Omagh CBS on a scoreline of 1-12 to 2-4. St Pat’s Cavan will now be in playing in their first MacRory Cup final since 1975.